The mortal remains of Cessna 175A VH-RDT (c/n 57057) in the process of being salvaged at the Carnegie Homestead airstrip. Coincidentally, Adastra's DC-3 VH-AGU was there at the same time and Tony Burgess recalls that the crew helped the Hazelton staff to refuel their truck before they set off on the long journey to Orange. The Cessna was a Rex Aviation demonstrator which was stolen from a hangar at Maylands Aerodrome, Perth on 24 July 1962 by a disaffected European migrant who was apparently determined to fly home. He ran out of fuel and made a forced landing 160 miles SE of Ethel Creek Station WA. The nosewheel was torn off in the landing on sandhill country. A large search failed to locate the aircraft until the man walked into Ethel Creek Station eight days later. The Cessna was then located by retracing his route. The engine, prop and instruments were removed and the aircraft declared an insurance writeoff. VH-RDT was struck off the Register in October 1962. 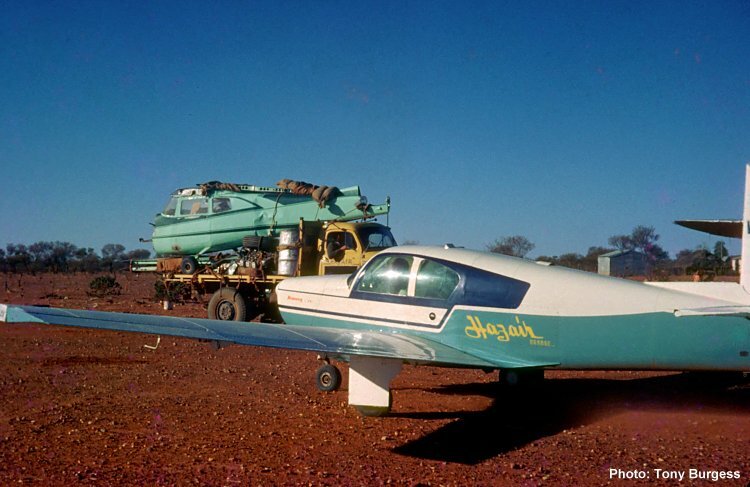 The aircraft was salvaged by Max & Jim Hazelton of Orange NSW and rebuilt, returning to the Register as VH-SEA in July 1963 to Hazair Sales & Service, Orange. The wing tip of Adastra's DC-3 VH-AGU can be seen in the background. The Mooney is M20B VH-MJH (c/n 1865) which would have been one of the first imported. It was registered to Hazair Agricultural Services at Orange, NSW, on 1 December 1961. It is presumed that the registration derives from Max & Jim Hazelton. It became VH-BAX with the South Coast Aero Club at Wollongong on 18 February 1963 and VH-KLX during 1966. It was involved in quite a few incidents as VH-KLX before being withdrawn from use, scrapped and cancelled on 30 March 1994. (Thanks to Geoff Goodall and Tony Arbon for the historical notes).